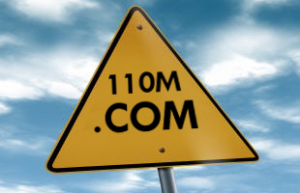 .COM domain passes the 110 million registrations mark - register your own today! The number of active domain names within the world’s most popular TLD .COM has recently exceeded 110 million, Verisign announced. For comparison, there are currently more than 15 million .NET domain registrations. Take advantage of the established track record and global recognition of .COM domain names and register one for your business today. It is easy and pain-free with Web Solutions’ team of experts ready to answer all your questions and assist you every step of the way. The suffix .COM is derived from the word “commercial” expressing the intended use of the domain names registered using that TLD. The domain was one of the first to be administered in 1985 and was originally regulated by the United States Department of Defense. Today, it is administered by Verisign and regulated by US law. The commercial distinction of .COM domain has also changed with the emergence of .NET and .ORG domains and opening them for unrestricted registration. Today, it remains the most popular TLD across the globe with internationalised .COM domains also available. One of the oldest and still existing .COM domain names include: ibm.com, think.com, xerox.com, boeing.com or sun.com. To check if the .COM domain of your choice is available, simply enter your desired domain name into search box located below or contact our Support Team on support@web-solutions.eu.